“I am not creating a new schism, and I do not break the unity of the Church; I go away from and I lead my flock: out of a subtle renovationist trap lest “imperceptibly and little by little we lose the freedom which our Lord Jesus Christ, the Liberator of all Men, has given us as a free gift by His Own blood” (8th Canon of the Third Ecumenical Council). We know full well what consequences were suffered by all those who openly disagreed with the “Declaration.” Lev Regelson, in his Tragedy of the Russian Church, states that Metropolitan Sergius in 1929 pronounced all those who opposed his Declaration to be counter-revolutionaries subject to arrest; fifteen bishops were arrested right away. The arrests were conducted very simply: a GPU agent would come to the bishop and pose one question: “How do you regard the Declaration of Metropolitan Sergius?” If the bishop answered that he did not accept it, then the agent would conclude: “That means that you are a counter-revolutionary.” And the bishop would automatically be arrested. So perished all those who raised their voices in protest. And the fate of Father Valentine could be no different. 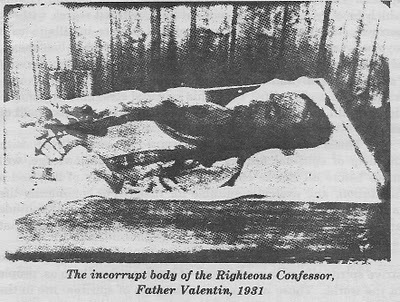 Thus did Father Valentine acquire a crown of victory from God, for he preserved the flame of genuine Christian inspiration and pinpointed the essence of the subtle temptation of the enemy of our salvation, thereby leading straight into Paradise the flock en- trusted to him by God, to Whom be glory and honor for ever. Amen.